Available in sizes ranging from 1-2.5 in. in length, Innerduct Pulling Eyes (Model 61510) feature threaded body that provides secure attachment to innerduct conduit. Hole in threaded end of pulling eye body provides tie-off of innerduct pulling line or tape, ensuring that unit is not lost during pulling operation. Also available with swiveling head-end and hex feature, pulling eyes can accommodate conduit inter-diameter dimensions ranging from 1-2.18 in. October 2009; Trevose, PA - General Machine Products Company, Inc. (GMP), Trevose, PA, is pleased to introduce a new line of Innerduct Pulling Eyes to its extensive line of underground tools and equipment. GMP's Innerduct Pulling Eyes make pulling innerduct conduit safer and faster. The Innerduct Pulling Eyes provide a secure attachment to the innerduct conduit due to its threaded body feature. A hole in the threaded end of the pulling eye body provides a convenient tie-off of the innerduct pulling line or tape, ensuring that the unit is not lost during the pulling operation. GMP's Model 61510 Innerduct Pulling Eyes are also available with a swiveling head-end and a hex feature. These swivels allow the pulling eyes to rotate as necessary during the pulling process, and eliminate the need for a separate swivel between the pulling line and innerduct. The hex head feature allows use of a wrench to make the final turns when inserting into innerduct. "Our Innerduct Pulling Eyes are built tough to withstand the rigors of innerduct conduit placement," said GMP's Director of Sales, Ted Clemens. "Based on feedback from the job site, we've fine tuned our pulling eyes' design for optimal performance." 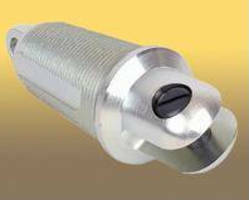 The Innerduct Pulling Eyes are made from durable chrome-plated steel. GMP's Innerduct Pulling Eyes come in a variety of sizes, ranging from 1 to 2.5 inches (25.4 to 63.5 mm) in length. The pulling eyes can accommodate conduit inter-diameter dimensions ranging from 1 to 2.18 inches (25.4 to 55.37 mm). More information is available online at www.GMPtools.com/nf/60510.htm, or by contacting Ted Clemens at 215-357-5500; info@GMPtools.com. For more than 75 years, General Machine Products Company is a global provider of a wide range of products for the telecommunications, power utility and cable television industries, and the contractors who serve them. Product applications include the placement of fiber optic, copper conductor, and coaxial cable both aerially and underground. GMP aerial cable lashing machines, Adams® continuous duty winches and fiber optic cable pullers are accepted as the industry standard. The complete line of GMP's 1,100+ products also includes cable reels and aerial blocks, cable cutters, unique RJ plug pressing tools, fiber optic cable blowing equipment, and other specially-designed tools for the data, telecommunications, and power utility markets. GMP's facilities include a 100,000-square-foot manufacturing plant in Trevose, PA, in suburban Philadelphia, and in Rutland, England (its CBS Products, Ltd. unit). Both facilities are equipped with a full complement of technologically advanced machine tools manned by a well-trained team of craftspeople. Conveyor Hook holds metal parts to be painted.